We bring you last week's top performances from New Zealanders who are playing abroad and who all have had prior experience of national team duties at youth or senior level. 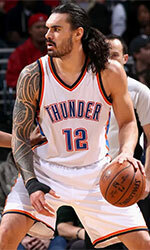 This week's number one is former international power forward Steven Adams (213-93). He could not help the Oklahoma City Thunder (49-33) in their last game. Despite Adams' very good performance the Oklahoma City Thunder (49-33) lost 99-104 on the road to the Portland Trail Blazers.